Zone face lift is an uniquely bespoke facial treatment that not only focuses on the physical effects of ageing, but treats the whole body, emotionally spiritually and physically. Developed by award winning reflexologist Ziggie Bergman, this wonderful new anti-aging treatment is being hailed by many as a very credible natural alternative to Botox. This uniquely relaxing treatment combines facial reflexology with advanced facial massage techniques, and the use of quartz crystal spheres, jade gua sha, and acupressure rollers. Looking for dermalogica facials in Woking? As a dermalogica facialist, I use the dermalogica products within this facial, tailored to your skin type, adding another layer to the treatment. If you would like to arrange a treatment for your Zone face lift in Surrey or the surrounding area then contact me today. Help to reduce stress levels, which in turn can relieve many stress related conditions. 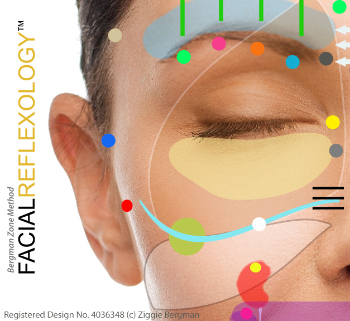 Zone face lift can be booked as a single session as results can be seen after just one treatment, but to get maximum benefits a 12 week course is recommended. This method of reflexology comes from a combination of native American techniques and Asian body maps that chart the reflex points on the face. Copyright 2015 © Mandy Cox Therapies.